Gold kicked off the week on a low note as prices dropped below the key psychological level of $1,250 an ounce as a result of a slightly higher dollar and some investors’ decision to sell their recent gains for the precious metal. Bullion prices were last down $7.90 at $1,246.50 an ounce in New York, while May silver was up $0.049 at $15.86 an ounce. A stronger dollar makes gold more expensive for holders of other currencies. 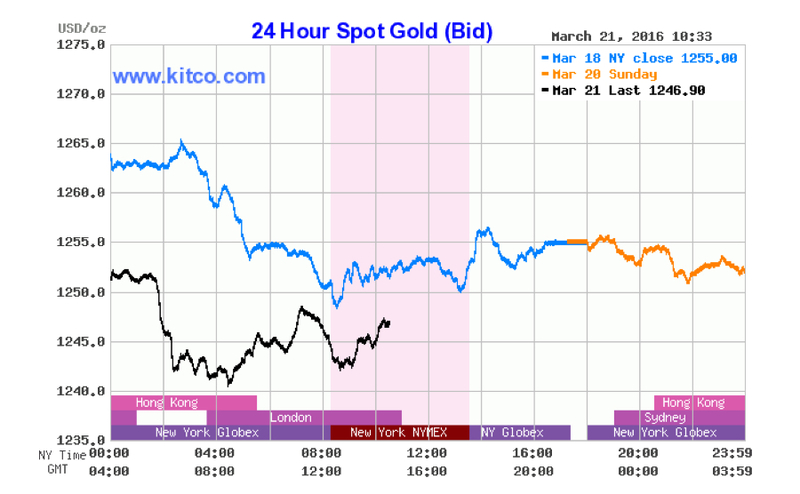 At the same time, the U.S. dollar edged higher, making gold acquisition more expensive for holders of other currencies. Precious metals had rallied last week after the Federal Reserve offered a reduced outlook for U.S. interest-rate hikes, down to 2% this year from the 4% it forecast in December. Higher interest rates tend to boost the dollar, but also diminish the value of holding gold, which doesn’t yield interests. Market clues seem to indicate that investors now see stronger risks of inflation, which has been almost non-existent since the credit crisis, despite scepticism from the Fed and the fairly slow pace of U.S. economic growth.